For one of my journalism classes, I was assigned to critique the website of a photographer whose work I admire. 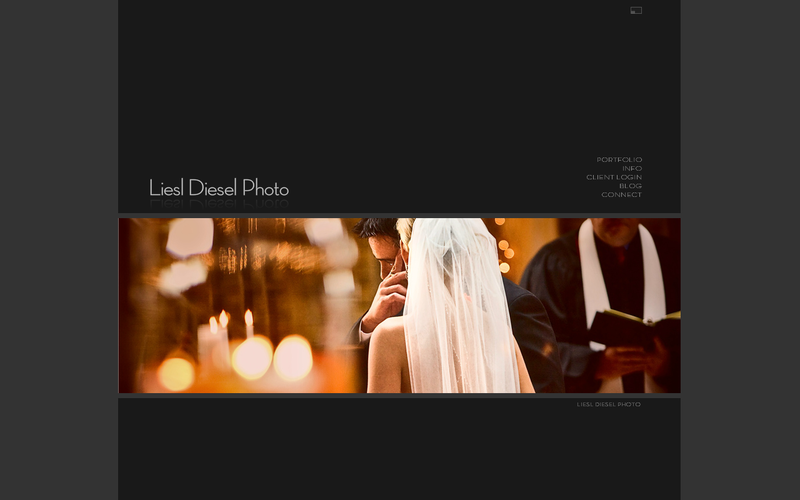 I chose Liesle Diesel, an amazing photographer who specializes in documenting weddings. I love her authentic style and ability to capture the beauty, humor and emotions of a wedding. Her work is a breath of fresh air from the corny, predictible wedding portraits you typically see. Liesle Diesel is fromChicago, IL, and is an award-winning member of the Wedding Photojournalistic Association. Liesel’s website is well designed with a unique flair. It is artistic and professional. The creative presentation of material fits very appropriately with her style of photography. She categorizes her portfolio by wedding stories, portraits and personal projects. She organizes her photos in a way that makes it easy to navigate. The slideshow on the main page shows a nice variety of images, displaying the range of Liesl’s skills with a mix of black and white and colored photos. There is an option in the upper right corner to view the website in full screen. The Facebook like box at the lower left corner is not distracting, but adds to the credibility of her work – showing 2.1 thousand likes. The font style and colors are consistent – white for inactive text and green for active texts. Liesl provides three layers of information in her ‘info’ tab: “why a liesl,” “bio-liesl,” and “buy-a-liesl,” allowing her audience to really get to know her. The blog and client login sites open in new tabs, making it easy for people to return to the home page without losing their place. The style of the blog is also consistent with the website. When viewing photos in the portfolio, they automatically begin rolling through a slideshow. However, if the user wants to scroll through the photos at his or her own pace, arrows appear on the right and left sides of the image, and there is the option of viewing the photos as thumbnails. There is an option to email the photo at the top right corner. The text “Liesl Diesel Photo” at the bottom right corner turns green when you move the cursor over it. This is misleading because when you click it, nothing happens. There is a lot of dead space at the top of the main page, the portfolio, and the info page. She could fill in more of the space by using larger photos and larger font sizes. From the ‘connect’ page, you are not able to click on the ‘portfolio’ tab. This is hidden unless you are in ‘full screen’ mode. On the ‘portfolio’ page, the text for subcategories is almost too small to read.